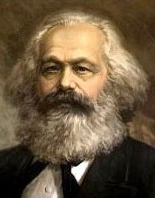 I called into the March 20, 2013 episode of Truth Hertz with Charles Giuliani (at 1:49:04) about Karl Marx, the Austrian School of economics, and gold. I mentioned how Engels encouraged Marx to write more about economics, and how Marx said he didn’t want to write anymore economic “scheisse” (sh*t), and how Marx was really the front man for others, in being associated with a secret society (The League of the Just), and it was Engels who posthumously published the second and third volumes of Das Kapital. The important part of the plank in the Communist Manifesto calling for a central bank is that it will have an exclusive monopoly on credit, and that the credit is supposed to be tied to gold, as we learn from reading Marx’s Das Kapital. Whether it’s Marx, Mises, Rand, Rothbard or Greenspan, they all lead you to the same place of a gold standard, whether government-regulated or so-called free market. Reblogged this on Recovering Austrians. I use the term “fictitious capital” to describe what the Big Bankers, public and private, are attempting to inflict on the ordinary 99% people who through their entrepreneur led labour create ALL REAL value, capital included. In the middle of the 19th century Karl Marx coined this term to describe the notes and loans that governments and gentry used to finance wars, luxuries, estates and otherwise living beyond their REAL means. Only his term was really new, Aristotle and many who followed him before Marx, elaborated on the dangers of worthless money. Democratic Athens and militaristic Sparta supplied the concrete examples of value and fictitious (worthless). At Marx’ time such paper would accrue during “Boom” times as the economy expanded and would usually max out at around 10-12% of a countries GDP. As long as the good times rolled on it was not a problem, but came a crisis of over production (of all the wrong things) there would be the day of reckoning. Ergo, the bill collectors came and cash not paper promises was the order of the day. This resulted in a variety of ways to settle; some were paid in part or in full but more often bankruptcies and swindles resulted. Then the stage was set for the next cycle – boom bust. Today though the situation with ‘fictitious’ or ‘counterfeit capital is vastly different. $$Dollars, Єєuros, RRubles, Ль, &с…all the same!! To grasp the idiocy inherent in these figures imagine approaching your friendly personal banker for a loan, line of credit or mortgage some 20 times your net collateral worth; how far do you suppose that might fly? Yet with the above listed gimmicks, that is precisely what members of the bankster clique, supported by military-industrial complexes do amongst themselves. Every day we read of new Central and private bank meetings, “Increasing capital base” is their current fad. There is not a farthing of REAL capital in all of this rat-bag of lies, swindles and manipulations. REAL capital is ONLY accumulated labour dedicated to enhancing future production. Ergo entrepreneur led LABOUR (of the 99%) is the only source that can augment existing capital or create new. The banksters, led by the IMF, USA FED, and British “financial services” are well aware of this fact but that will not stop them from attempting to download this fraud onto the REAL product of Labour in the form of “bailouts” of “sovereign” debts, to be serviced by taxes on the REAL producers. Let them eat cake!” exclaimed La Royale Marie Antoinette. So Greece, you are the front line today, Italy and Spain may be next, but do not think that any country, including the relatively well off Germany or the resource rich Canada and Australia will be forever exempt. Ms Merkel, beware! The “poor little ones” are but appetizers; they will whet the appetites of these financial service vultures and jackals. For certain, like buzzards flocking to road kill. if they succeed in the beginning the taste of financial carrion will make them hunger for more, and they will finish only when the 99% of humanity is subject as debtors to enslavement by the 1%. But this does not have to be! Greece, Cyprus, you can repudiate the fraud! Lead the way! DEFAULT, Repudiate, is the way to go! 99%; be inclusive! Occupy-Idlenomore, Support Greece and Slovenia today, Italy Spain, …, &c. tomorrow and…/?/ the world in future. Hold on to your souls! Hang tough! You have a WORLD to WIN! !